We’ve discovered yet another source for great boosting energy. As you may know, Don and Francisco recently completed a trip to the Caribbean to do some gifting and such. See gifting report here. 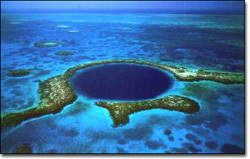 As you’ll see in the report, they gifted the giant blue hole in the ocean in Belize. There’s a picture of the blue hole on my sidebar at right in the rotating slide show that I put up a few months ago before they even left on their trip, when Azti posted it in a chat. I think I knew unconsciously that it would be an important spot on the earth because I was really drawn to it. Anyway, Don and Francisco had a big challenge getting to the blue hole to gift it, and had very rough weather afterwards, which confirms that the ex-powers didn’t want it gifted. In the chat last Sunday, we were all very foggy and unable to see anything. We started using the blue hole energy to boost, which is a very strong column of energy we could see coming out of the blue hole. Suddenly, everything became clearer. If all the psychics in the chat have foggy vision at the same time, it’s pretty obvious we are being blocked. Once we started boosting with the blue hole, we got huge results. It became apparent that the blue hole energy was from the heart chakra of the earth. It’s similar energy to the Creator Vortex, located in Iran, which we believe is the original vortex created on the earth. Now I think of the Creator Vortex as the first chakra of the earth. So with the Creator Vortex, we drain negative energy from the earth and from around any target. With the Blue Hole we boost from the heart energy of the earth. It’s a pretty powerful connection and anyone can use it, just like anyone can use the Creator Vortex energy once they hook up to it. I’m starting to think that this blue hole is the whole reason Don and Francisco were supposed to make this difficult trip. I like the blue beam! Can we seek to uncover and gift earth’s 2nd, 3rd, 5th, 6th and 7th chakras? It would be cool to have them avaialable too! I’ve had the same thought, Edu. We have felt the chakras of the earth in our boosting chats previously, but this is the first time we’ve really felt the physical location of the chakras. I hope we will be able to perceive the other chakra locations as we continue with our group chats. I wonder what happens if one person boosts from the creator vortex and another one boosts from the great blue hole, both boosting the same target! One last idea. The ego of the planet earth (something like gaia, she’s also the ego of the plant kingdom) is said to be found in the center of earth in the blue ether. Perhaps if you ask her she might show you the other places.